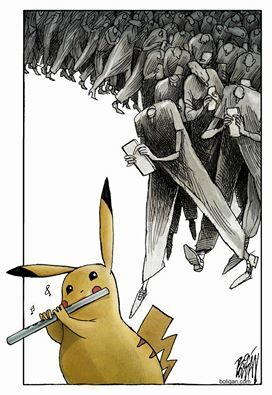 The backlash from Creatives against Pokemon Go is starting to come out. 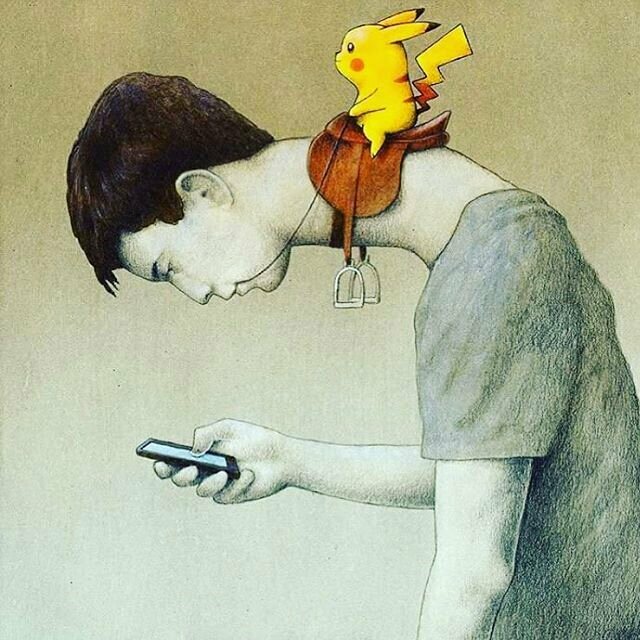 Pokemon Go is for sure going to be remembered as yet another MEGA FAD. However, as all things that become mainstream where droves and droves of "lay users" flood a service, the Creatives / Tech Hipsters turn their nose up at the crowd. The paintings above demonstrate this beautifully. Like Tomagatchi, like Hush Puppies every handful of years some new thing sweets the US and the World and becomes the most talked about new term. For 2016 it is Pokemon Go. The game has sky rocketed at unprecedented speeds, and has massive daily engagement. At the heart of it, is the emotional simplicity of the tag line : "Catch them All"
Referring to catching as many of the varied Pokemon's out there as possible. It is an addictive, fun, and simple call to action. It's also brag worthy, to show off to your friends and family how many Pokemon's you have. From a technical point of view, this is a very positive thing. Pokemon Go propelled Augmented Reality game mechanics into the lime light. This is very good for the young but rapidly evolving AR and VR spaces (Occulus, Magic Leap, Meta.AR , HTC Vive, etc etc). From a hipster / techie / geek point of view this is a bit of a transgression against your niche world view. Before Pokemon Go was a hit, it was a game called Ingress made by Alphabet's (Google) Niantic Labs . It was an uber geeky game , with 2 teams, where the goal was to get to "portals" and to "hack" them. In short the exact same dynamics as Pokemon Go, but without the theme / packaging provided by a world famous cartoon, movie, and gaming franchise backed by Nintendo. P.S. As a side note it is also amazing to observe how the same game gets transformed from a deep geek title , to a world phenomenon when you wrap it in a cool theme. This is a really good read for me, Must admit that you are one of the best bloggers I ever saw. I like very much the Best Sector 9 Bamboo Longboard . fulfillment that you have worked so difficult to get. TUTUApp is rapidly becoming the platform of ... VIP users can download the most popular and in-demand games, apps.